Bi-folding doors are an increasing popular choice for many homeowners, the multi-folding doors with a low threshold create a 90% clear opening that allows complete access to your garden and successfully brings the outside in. Not to mention they are a striking and aesthetically pleasing addition to a home witch can significantly increase its value. Bi-folding doors, like any other doors and windows, can come in a range of different materials each with their own strengths and weaknesses. Aluminium however is becoming a fast favourite as it successfully combines the best of practicality, economy and style. Below are just a few reasons why aluminium is the right choice of material for your new bi-folding door. 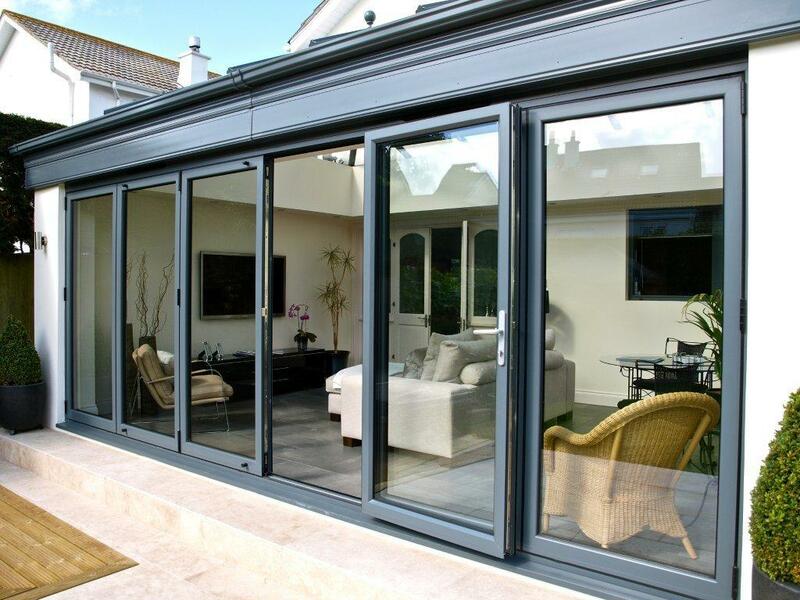 All bi-folding doors are designed to offer excellent views of your outdoor area, however by opting for aluminium you can make the most of your investment. The lightweight structure offers a narrow frame, and with its strength allowing for larger panes of glass, it can maximise your outlook and increase the level of natural light within your home. As it is a non-corrosive material, aluminium is extremely low maintenance. Whereas solid hardwood frames require regular upkeep to keep them looking good, all aluminium requires is an occasionally clean with a light soapy solution. It is also the preferred material for most homeowners as, unlike other materials, it won’t twist or warp with age or exposure to the elements. And with the unpredictable nature of the British weather that can only be a good thing! Plus, an expanding frame around the glass can create fractures that can lead to the failure of the seal and cause the cavity in the double-glazed units to mist up. A number of the highly practical features of aluminium make it one of the most cost effective materials on the market, and a smart long term investment for your home. As a cheaper alternative to the likes of steel it is not necessary as strong but it is, as aforementioned, very durable and built to last. Additionally if you are serious about improving the energy efficiency of your home and saving some money on those heating bills then aluminium is the right choice. Modern aluminium doors are fitted with a thermal break, which resists thermal transfer from one side of the door to the other. The strong frames also means the material can support the extra weight of triple glazed units. Keeping you cool in summer and warm in winter. It could be argued that materials such as timber are more aesthetically pleasing than aluminium. However with the wide range of colours, styles and finishes available for aluminium frames, whether you want to opt for a sleek and minimalist black or grey, brighten your home with white or cream, or make a bold statement with a primary colour there is the option for you. With such a wide range, your bi-folding doors can be styled to match your existing windows and doors, whatever the material, enabling them to seamlessly blend into the aesthetic of your home.